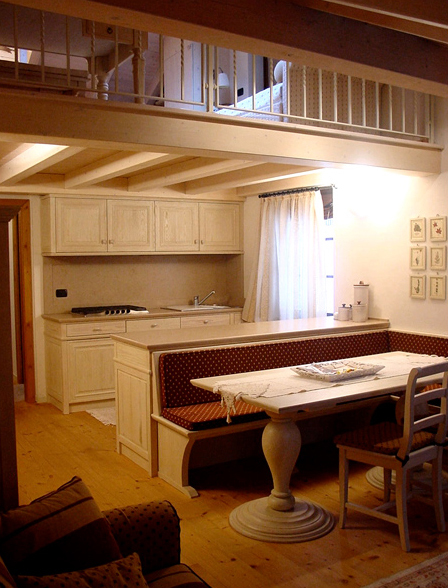 The kitchen is certainly the most lived-in room of the house: moving within it comfortably is indispensable. Always being satisfied with the style and functionality of one's kitchen is a precise demand of Viem customers, and is the objective of every one of our projects. 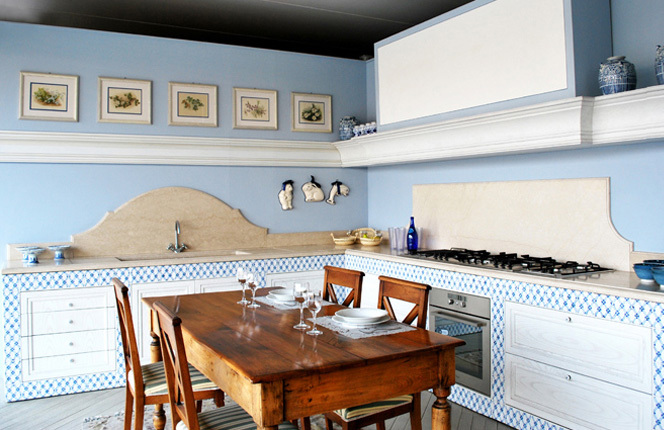 Our production proposes creations in traditional and modern styles; in this section we showcase some models of traditional kitchens we have created in recent years. Kitchen with brush lacquered and hand floated doors. 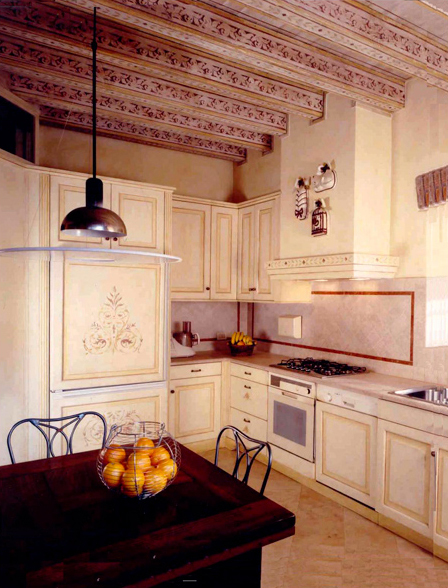 Countertops in Biancone marble of Vicenza. Sinks in cut marble measuring 140 cm with bushhammered front panel. Franke stainless steel eye level oven. 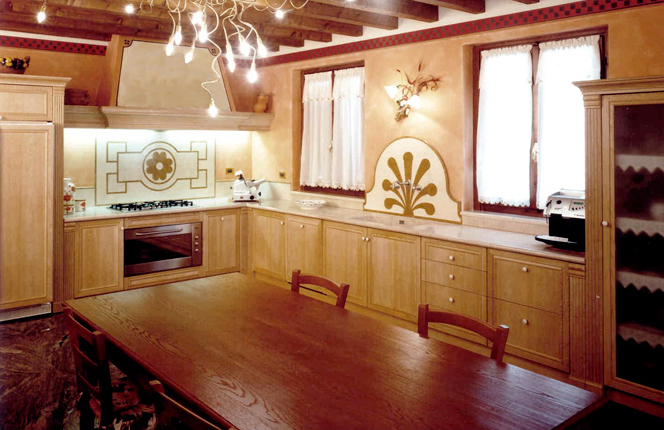 Kitchen with white lacquered oak doors, with open pore brushing, and hand decorated ceramic wall covering. Botticino marble countertop, with an antiqued finish, backguard in shaped marble. Recessed 90 cm cookers and barbecue. Italian walnut table of the late 1700s. Kitchen doors in ivory brush lacquered fir. Countertops in antiqued Trani marble. Double sink in cut marble, 140 cm. Island hood with shaped framing. 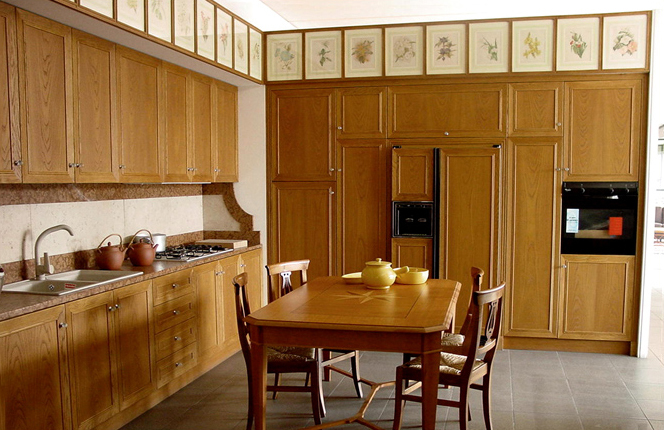 Kitchen with edged chestnut doors. Column wall with General Electric refrigerator with an ice maker. Above that are antique prints with floral motifs. Countertops in acid-treated Red Verona marble. Backguard in Red Verona marble with Pearly Pink coffered inserts. Hanging cabinets 120 cm height with closing panel on the counter. Countertops in antiqued Black Canada marble. Backguard in Black Canada marble with bushhammered bands. 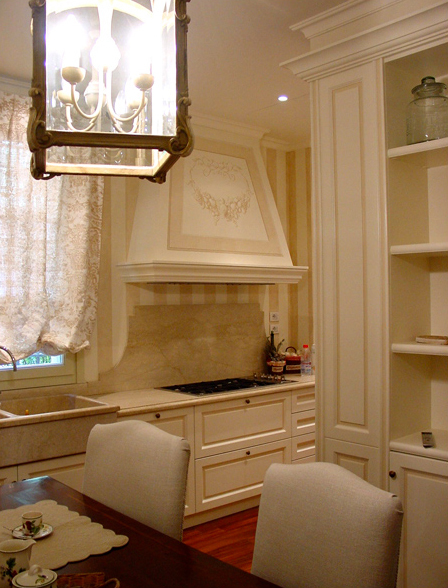 Kitchen with ivory lacquered and floated edged doors. Small peninsula counter dividing the dining area. Hood with shaped shelf and buttress. Countertop and backguards in Biancone of Vicenza marble with bushhammered band. Kitchen in faded oak with edged doors. Hanging hood with antique print insertion. Countertops in shiny Travertine marble. 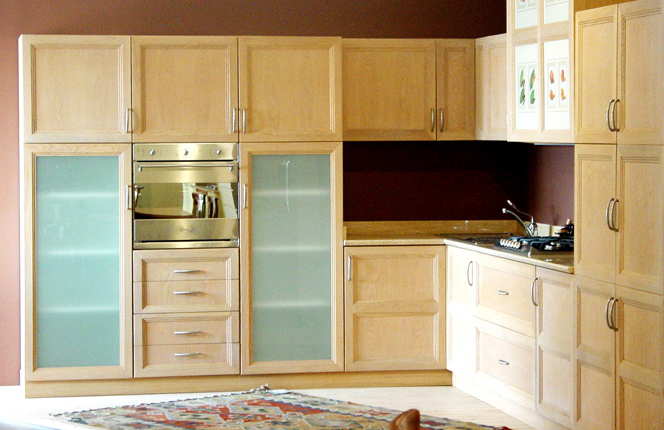 Honey oak kitchen, edged doors with crystal knobs. Countertop with shiny Botticino marble with cut sink insertion. Marble backguards with inlaid decorations. Kitchen in brushed pickled ivory oak. Refrigerator block with chiselled pilasters and upper vasistas. Fireplace that can be used as a barbecue. Large cornice with sconce spotlights. Oak lunch and work table. 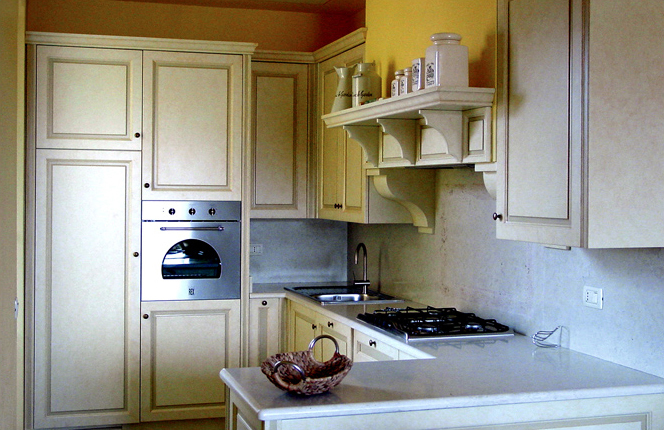 Ivory lacquered kitchen with edged doors. 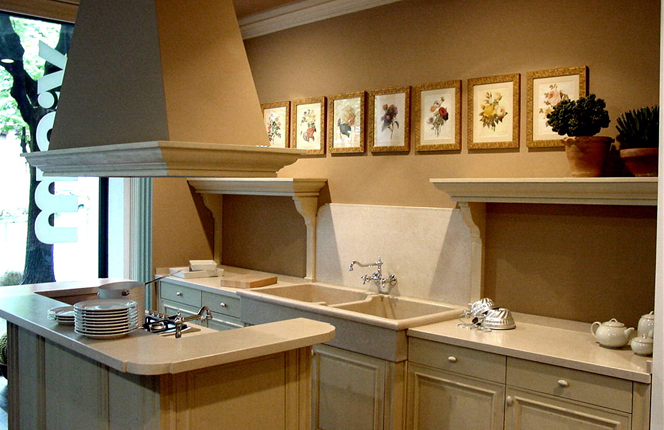 Decorated hood and shaped cornice. 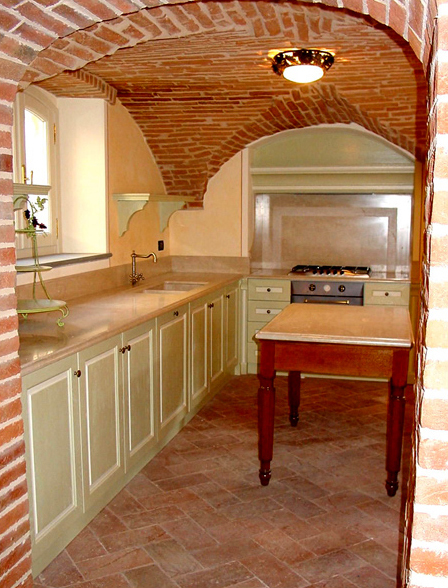 Countertops in antiqued Botticino marble. Large sink in cut Botticino marble. Column in niche with chiselled pilasters and Lacanche stainless steel kitchen block. Column with double panelled refrigerator door and a recessed stainless steel oven. Under window sink block in cut marble with front in view. 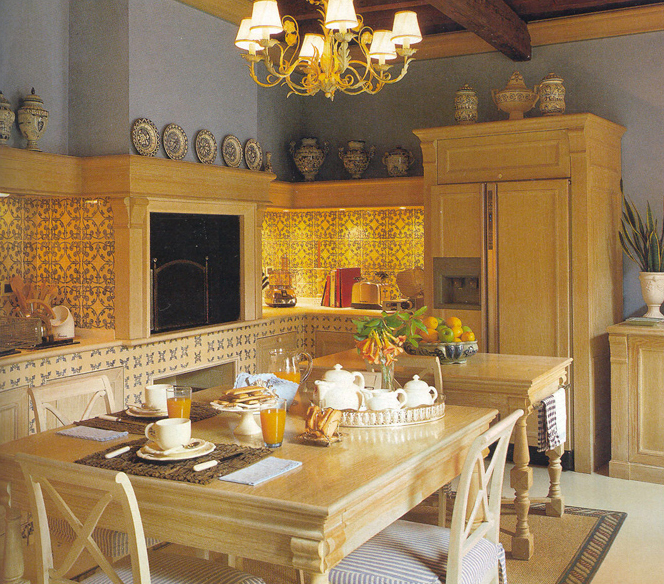 Island with carved pilaster and countertop in antiqued Botticino marble. 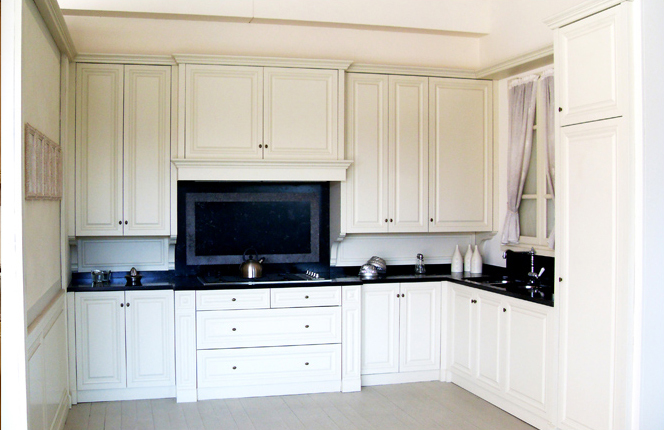 Kitchen with lacquered and edged brush painted doors. Countertop in antiqued Botticino marble. Marble backguard with Red Verona insert. Kitchen with fir edged doors, ivory brush lacquered. 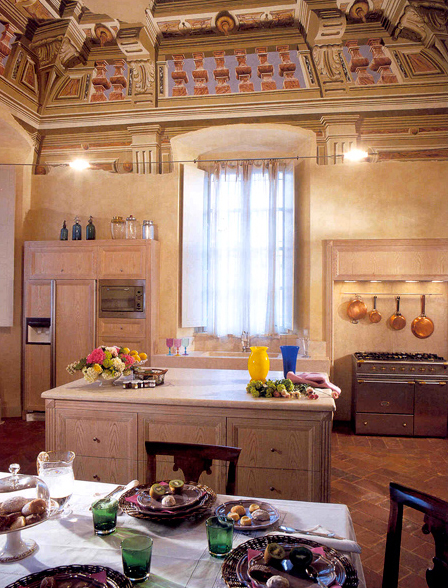 Dividing peninsula and kitchen with antiqued Trani marble. Table with carved round stands. 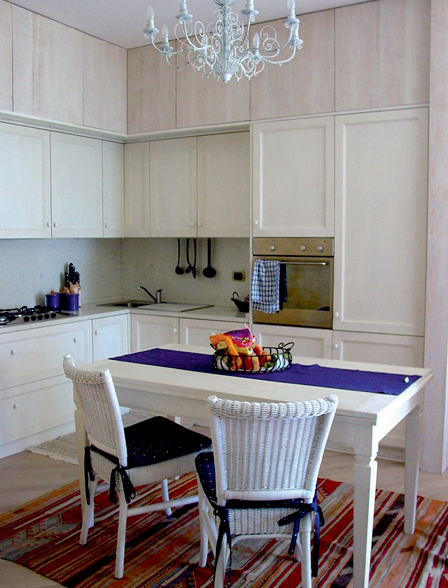 Kitchen with oak edged doors, white brushed lacquer. High hanging cabinets 60 cm deep, smooth brushed faced doors with neon light insert. Countertop and backguard in shiny antiqued Biancone of Vicenza marble. 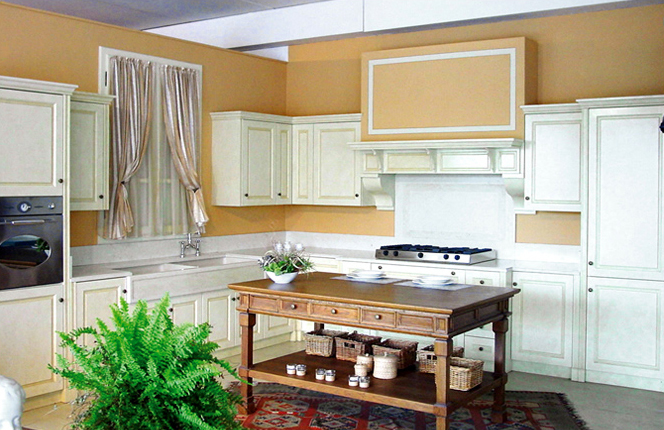 Kitchen with brushed oak doors and green brush lacquered with ivory background. Niche with recessed oven and two drawers, upper hood with carved cornice. Window side shelf with shaped buttresses.